When did the future get postponed? Growing up in the 1970s and 1980s it felt as if innovations that might change and improve our lives beyond recognition were tantalisingly just around the corner. Surely the science fiction utopia of a life set free from drudgery, where our preferred mode of transport would either be a teleport or a jet pack, should have arrived by now? Yet well into the second decade of the 21st century our children face a world where materialism is unchallenged and the possibility of taking the hard collective decisions to safeguard our planet has receded. In music too that sense of development and progression has goneas if the ubiquity of the past, afforded by the internet, has made time fold in on itself. Think of the regular, near seismic, genre shifts between say Elvis in 1956, 1960s psychedelia, disco, punk, acid house and mid-1990s drum and bass would any record from today beamed back 20 years sound as impossible as, say, Chic's "Good Times" would to a music fan in 1959? When Pete Shelley of the Buzzcocks sang, in 1978, of 'nostalgia for an age yet to come' it felt like a play on words rather than a cultural diagnosis, yet as the late journalist Mark Fisher put it, the internet has effectively brought about the " ...slow cancellation of the future... accompanied by a deflation of expectations...."
Electronic music, such as this wonderful record by Phil France once of the Cinematic Orchestra, was once the epitome of these visions of now cancelled futures. If France's album could have been made in 1997, it is only because it bears the stamp of those more utopian times, by continuing to look forwards for better in defiance of probability. If, in the parlance of the times, "The Swimmer" is the soundtrack to a movie yet to be made it would be a low key, emotionally charged, personal drama where a lingering melancholy is justified by the tragedy that strikes in the final reel. The emotional poignancy to the music here is up with the best of those early 'Café Del Mar' albums, compiled with love and eclecticism by Spanish DJ Jose Padilla. These compilations thought nothing of placing music influenced by say the modern classical minimalism of Steve Reich, the Penguin Cafe Orchestra or the sonic spaciousness of ECM alongside music developing Brian Eno's ambient experiments, Andy Weatherall's 'Sabres of Paradise' or Matt Winn's D*Note. The music had a brief flirtation with the mainstream late in the 1990s, but disappeared once adverts started using softened versions as a sound bed and "Chill Out" compilations briefly became ubiquitous. The odd direct crossover influence aside their relationship to jazz is oblique, more of a kinship from the shared openness to different forms of music and the sense of space in the sound. So you can hear the classic Café Del Mar sound in France's opener and title track "The Swimmer" where a delicate swirl of cymbal caresses the repetitive piano line of the main theme, until the lovely descending string line enters towards the end of the piece. It's a highly effective evocation of summers and good times past. Better still is second track "Transition" where the electronics are more futuristic and the string line builds and swells underneath before foregrounding a statuesque beauty in the final section. "London Park Hotel" feels like Steve Reich having flashbacks to vacation highlights having returned to a cold place -if Dante Alighieri is right that "No sadness is greater than in misery to rehearse memories of joy" then this would be a fine soundtrack. "Animator" uses a warm decayed analogue synthesizer line, reminiscent of Weather Report, but underlays it with a melancholic string line that feels like it would sit well on Bjork's "Homogenic." 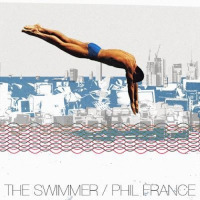 "The Swimmer" was actually originally released in autumn 2013 on 26-2 records, but has perhaps found its natural home on Manchester's open-minded Gondwana records. Sonically excellent, emotional, thoughtful and soulful Phil France has made an album that deserves to be heard and widely appreciated. Highly recommended. Track Listing: The Swimmer; Transition; Kubrick; Joy of Brass; London Park Hotel; December; Animator. Personnel: Phil France: keyboards, synths, programming, string arrangements, double bass, bass guitar; Stuart McCallum: guitar; Richard Spaven: cymbals, drums; Daniel Bridgewater-Hall: violin; Sernay Wu: cello; Phil Kay: programming; Vincent Helbers: drums; Susannah Simmons: first violin; Adam Robinson: second violin; Naomi Koop: viola; Patrick Carpenter: Architectonics.